Image caption It is thought to be the first university in the UK to declare a "climate emergency"
The University of Bristol has declared a "climate emergency" to acknowledge the "deep concerns" its students have about their future. 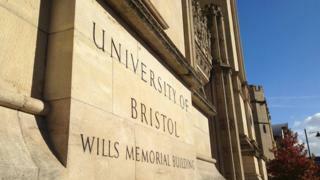 A petition signed by 500 students has urged the university to "demonstrate its commitment to sustainability". The university said it has identified a "strong link" between climate change anxiety and mental health issues experienced by students. It has already pledged to become carbon neutral by 2030. It is thought to be the first university in the UK to declare a climate emergency. The university said it has already reduced carbon emissions by 27%, and planned to "divest completely from all investments in fossil fuel companies" by 2021. What is a climate emergency? Deputy vice-chancellor Prof Judith Squires said: "The University of Bristol plays a key role in fighting climate change, it does this through its research, its teaching and how it operates. "Calling a climate emergency highlights the urgency of the task we are engaged in and I hope others join us in increasing their action on this, the biggest challenge we face." Bristol City Council declared a climate emergency in November, and announced it planned to be carbon-neutral by 2030. The city was awarded the European Green Capital in 2015 for its high environmental standards and commitment to further improvement and sustainability. Climate strike: What is a climate emergency?